All-nighters, highlighters and lots of coffee usually sum up many students' finals week traditions. However, one of UK's favorite traditions hopes to alleviate some of the stress of finals week, even if it's just for one night. Midnight Finals Crunch Brunch is from 9 p.m. until midnight, tonight, Dec. 12, at Memorial Coliseum on UK's campus. Crunch Brunch is sponsored by the Student Activities Board. A valid UK ID is required to attend this free event. Students can come and enjoy a free hot breakfast served by UK faculty and staff. Each student who attends Crunch Brunch will receive a free long sleeved T-shirt while supplies last. There will also be activities such as an oxygen bar and free five minute massages by massage therapy students to help give students time to relax and unwind. Corn hole and a basketball free throw tournament will also take place and students have a chance to win prizes. DJ Phat Katt will spin music all night. Some special UK staff members will also be making appearances at Crunch Brunch throughout the night, including President Eli Capilouto and Dr. Mary Lynne Capilouto. Academic advisers from each college will also be around to answer questions about scheduling and give out free prizes. In addition, starting at 9 p.m., UK Hoops Coach Matthew Mitchell will sign autographs.Shuttles will be provided to students in need of transportation starting at 8:15 p.m. and end at 12:15 a.m. 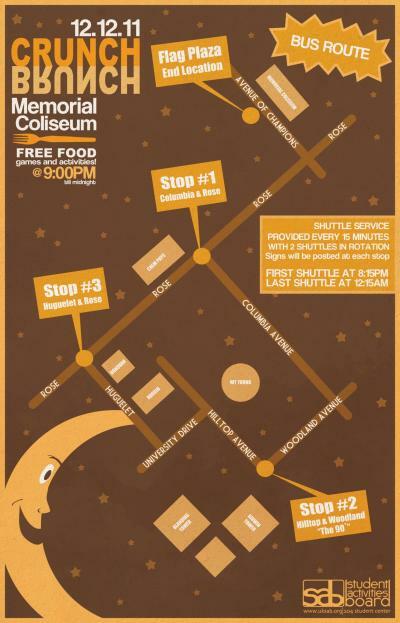 The complete bus route can be found at www.uksab.org or the SAB Facebook page. Crunch Brunch has become a tradition at the University of Kentucky. For over 10 years, the Midnight Finals Crunch Brunch has taken place on the Monday of finals week each fall semester providing UK students a time to have fun and relax before taking finals and leaving for Winter Break. The Student Activities Board brings more than 100 entertaining, educational and enriching programs that are reflective of contemporary issues and trends to the University of Kentucky annually. These programs are designed to enhance the college experience for students, faculty, staff and the greater Lexington community. Connect with SAB at www.uksab.org, follow on Twitter at twitter.com/UKSAB or like SAB on Facebook at www.facebook.com/UKSAB. For more information about SAB and SAB events, contact publicrelations@uksab.org or text a question beginning with SABQ, followed by your question or comment, to 411-247.